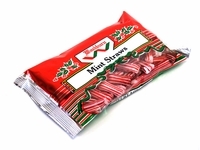 Mint Straws are a favorite old fashioned Christmas candy . Bite size red and white striped hard candies with a mint flavor. These are a must have Christmas treat. We have all your favorite old fashioned Christmas candies. Filled raspberries, cut rock candy ant thin ribbon. Everything you need to make your Christmas Special. Please note this are not mint filled straws.